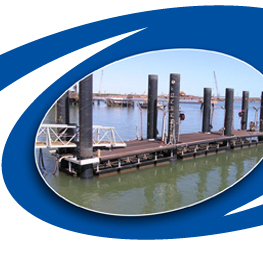 Cervan Marine is experienced in all aspects of Marine Construction. From pile driving, beacon removal and placement, to the installation of marine monitoring equipment, platforms and jetties, Cervan Marine can do the job. Cervan Marine is currently the main contractor for the development of the Port Hedland Port Authority 9 and 10 Development at Port Hedland. This involves the complete construction of the Tug Pen, from pile driving to installing the access platforms. We have been involved in many pile driving projects where our diversity of service has been utilised. Our extensive experience includes pre-split for sheet piling and drilling and blasting for pile penetration into rock around piles. We have also provided commercial diving services to other pile driving contracts. Construct a small craft jetty for use by local vessels. Jetty length 70 metres. Pile driving of cyclone tie downs for new shiploader system at Port Authority Berth No.1. 10,000 tonne of rock placed on seabed to create an artificial reef, approximately 50m from parker point iron ore facility. Development of tug-pens 9 & 10 involving supply, fabrication and installation of steel works, pile driving, plumbing, electrical, cathodic protection, floating pontoons and all safety equipment required. We are currently working on demolition of the access landing to the tugs and transforming it into a floating platform arrangement. This involves steel fabrication, plastic molding, sandblasting & painting and underwater welding & cutting.